NEW DELHI: The Modi government is quietly working on a plan to export defence equipment and armaments produced in India to friendly countries. A beginning could be made by exporting BrahMos missiles to Southeast Asia and South American countries. Vietnam, Indonesia and Venezuela have expressed willingness to procure the supersonic missile jointly produced by India and Russia, sources indicated to ET. Indo-Vietnam defence ties are on an upward trajectory and Hanoi has been keen for the last few years to purchase this missile. However, there was no progress under the UPA government on the issue, sources indicated. BrahMos missiles have been inducted in all three defence services. The inter-governmental agreement between India and Russia for development of BrahMos missile (290-kmrange) also stipulates use of this advanced system to be inducted into the Indian and Russian armed forces as well as export to friendly countries. Vietnam and Russia are partners since the days of the Cold War and it can use Russian made defence equipment. India will sign an agreement for supplying defence equipment to Vietnam, during President Pranab Mukherjee’s trip from September 14-17. India and Indonesia also share good defence ties that encompasses training and defence exercises. Recently, Prime Minister narendra Modi had stated that India should move towards self-reliance in producing military weapons and systems and also look for exporting them to friendly nations. 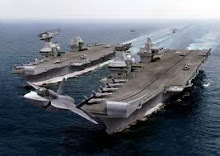 The idea for defence co-development and joint production is not only to obtain cutting-edge technology and self-sufficiency in the long run but also export jointly developed products. So far, India depends on imports for meeting over 65% of its weapons requirement and has been branded as largest importer of arms by international think tanks. India could also export indigenously developed ‘Tejas’ – Light Combat Aircraft, ‘Akash’ – air defence system and ‘Prahar’ class of missiles to friendly countries. Tejas is a lightweight, multi-role, single-engine tactical fighter aircraft. Akash, a surface-to-air missile, has a range of 25 km. Prahar is a 150 km-range tactical missile system. Several countries have shown interest in the Akash missile system, which was ready to be inducted into the Army. LCA is likely to be ready for induction into IAF by the end of this year after attaining the final operational clearance. Sources also claim that Indian weapon systems are cheaper than Chinese systems. 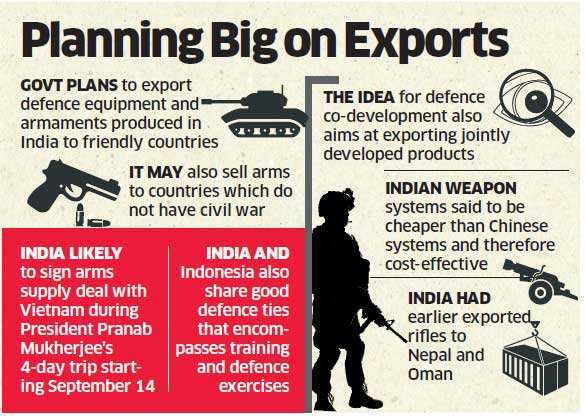 formal defence exports policy, it had earlier exported rifles to Nepal and Oman, besides supplying defence equipment to Myanmar including tanks, radars to Sri Lanka, defence equipment to Maldives, maritime patrol boats to Mauritius and defence spare parts to Vietnam. India’s current norm for defence exports involve supplies not only to friendly countries but also to countries which do not have civil war. “We do not want a situation where arms supplied by us is used by one group against another within the boundary of one country.